Creating beaded jewellery is a fun and creative way to expand your design repertoire. There are so many different options when it comes to beading and a whole variety of tools to help you create what ever your imagination thinks of! 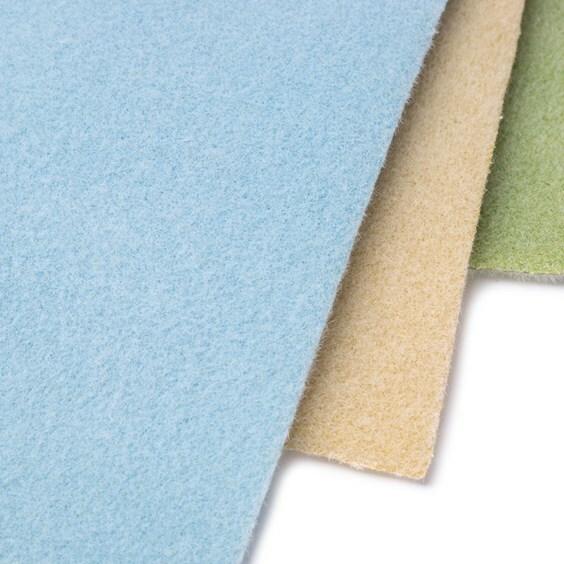 On this page we have compiled a list of the essential tools for beading projects. These tools will help you save time as well contribute to a better finished piece of jewellery. This deluxe diamond bead reamer set by Beadsmith is a must-have for all beading enthusiasts. Due to the way semi-precious gemstone beads are drilled, the holes can sometimes be very tiny in the middle and it can be so frustrating when just a few of your beautiful beads don’t quite fit onto the thread or wire you have chosen. The set includes a small and a large reaming point for smoothing, straightening and enlarging holes and a 45° edging point for rounding and smoothing holes where sharp edges could cut through thread. The points are easily changed and can be stored inside the hollow handle so they are always to hand. Spare points are also available. 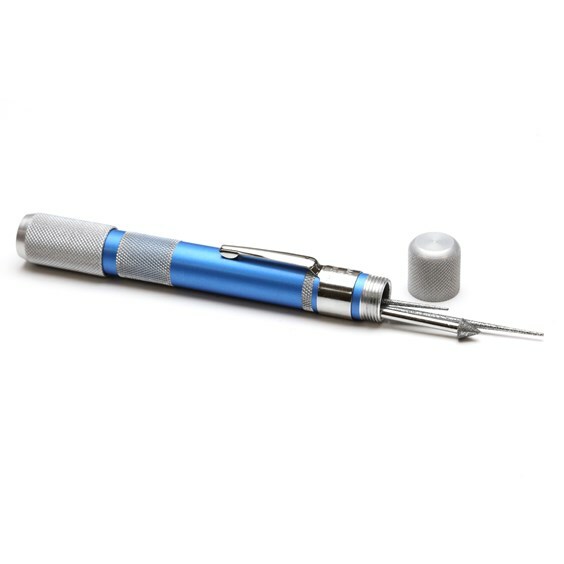 This handy gadget eliminates the need to rethink your choice of thread or change your design by enabling you to gently enlarge the holes in stone, glass, ceramic beads as well as pearls. you can adjust any of your beads to fit a wider range of beading threads and cords without having to worry about changing your designs if a bead will not fit o to the chosen threads. Simply secure your bead in to position, insert the reamer in to the drill hole and twist, we recommend that you twist until you reach the centre point and then turn the bead and work it from the other side to create an even hole throughout the bead. Used with water to lubricate and just a couple of gentle 'twists' is all it usually takes. These bead stringing needles are fine, flexible twisted wire needles with a collapsible eye for stringing beads with small holes. 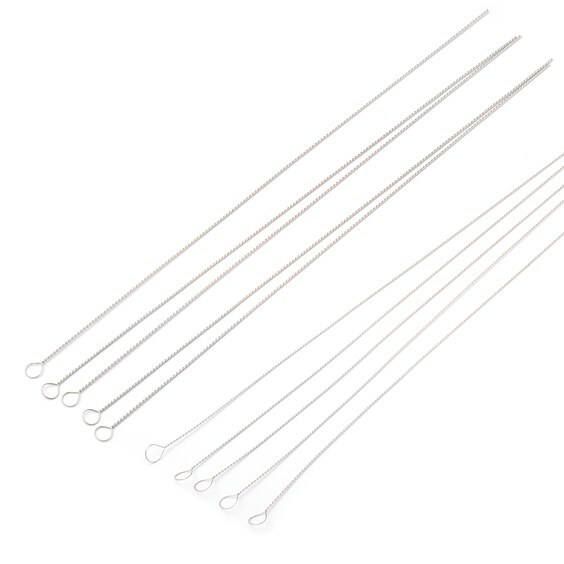 Available in fine and medium in packs of 5 needles. These make threading multiple beads with a small hole on a fine thread a whole lot easier! They are a real time saver. Simply thread your fine beading thread trough the small loop hole at the end of the needle and then place the beads down the needle and push over the loop onto the thread. Pack of Pliers and Side Cutters. 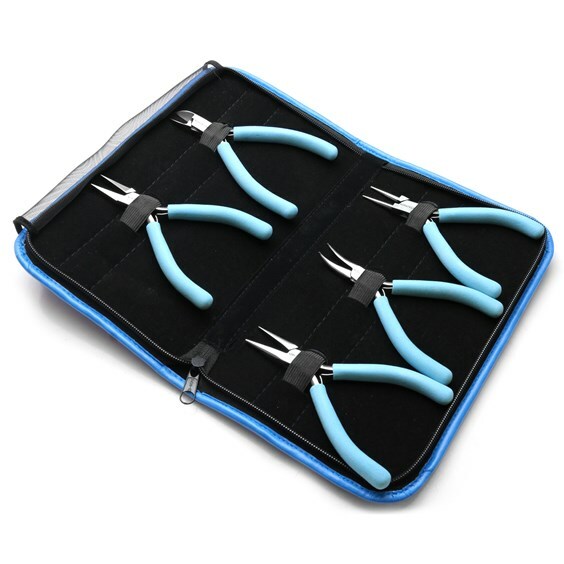 This is a handy pack of useful pliers with comfortable handles in a zip-up case. The pack contains all the pliers that you are likely to need for jewellery making and bead stringing. It includes snipe nose (also known as chain nose), flat nose, round nose and bent nose pliers as well as a pair of side cutters, making it an excellent buy for jewellers and beading enthusiasts alike. Pliers are one of the most useful tools you will need when making any type of jewellery, The different noses options available in this pack will come in really handy for different projects, theres nothing worse than getting half way through something and not having the right tools to complete it. Buying this pack is much cheaper than buying the pliers individually and you get a handy case to keep them all in. You will find that the different pliers will have different uses, the snipe nose are great for opening and closing jump rings, the round nose for making connections and wire wrapping and the cutters you can use to cut wires threads nice and close to keep your work looking nice and tidy. This handy bead mat is made from a special fleecy fabric with fibres which prevent your beads from rolling away. At 35cm x 28cm it is plenty big enough for most beading projects and can be easily rolled up or folded for easy storage. When making (especially beading) small things have a tendency to roll away and disappear. This mat will stop this from happening, if you drop a small bead on to the mat it will just stay put - saving you lots of time and hassle crawling around looking for that bead that got away! Simply put the mat down wherever your hands are going to be working, for example on your workbench, your kitchen table or lap tray so you can make whilst watching the TV. Thread snips are ideal for cutting beading thread, thin wires, textiles, yarn, gimp or french wire and much more. 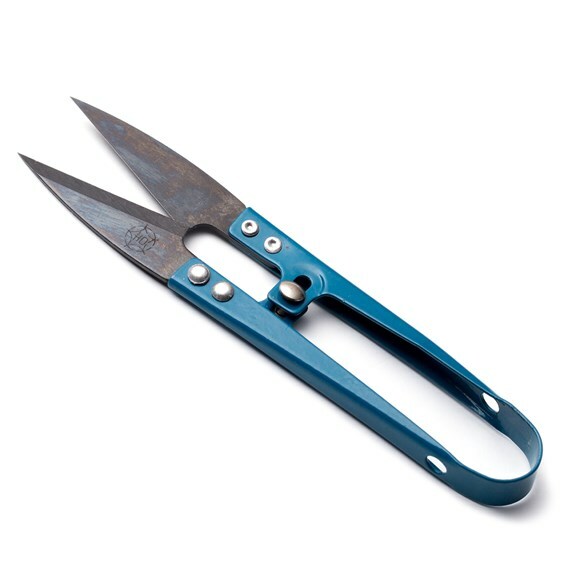 Thread snips are sprung so they can be used with ease, even in hard to reach places. The strong blades are sharp enough to leave a nice neat end after cutting. At approximately 11cm long they are small enough to be held in the hand while your fingers manage fiddly jobs such as knotting. Unlike scissors, they can easily be manipulated and operated with only one hand which can prove invaluable when you cannot let your thread go for risk of losing all your beads! Use as you would scissors.